If you go to any major city today, you are bound to see a variety of options for boutique fitness studios. From heated workouts to cold workouts, workouts that focus on your heart rate or your speed, fitness enthusiasts have their pick when it comes to experimenting with new workouts. But, in the sea of all of the options for fitness today, one trumps them all- slow, high-intensity training. Although the movements are slowed down, high-intensity training is actually one of the most effective workouts out there. Plus, you only have to work out once a week, saving you time and money compared to other gyms. At QuickHIT Fitness Labs, your time and money will not be wasted on your way to achieving your fitness goals. If you are skeptical about how slow, high-intensity exercises can be so much more effective than other workouts, read on for some of the top benefits of high-intensity training. Although most people believe they need to engage in intense “cardio” workouts like running or biking in order to improve their cardiovascular health, you can actually achieve the same goals with strength training. 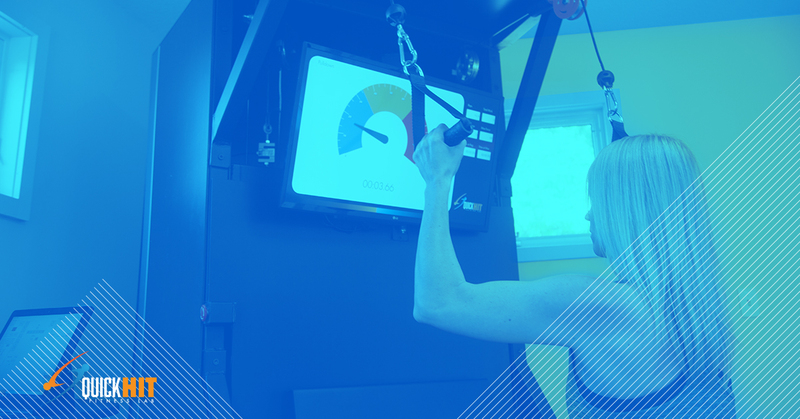 When you choose a high-intensity workout at QuickHIT Fitness Labs, you’ll be simultaneously moving towards your goals for strength and cardiovascular health. Our workouts safely push your muscles to the point of failure, which means your heart and lungs have to work much harder than usual to get oxygen to those muscles. The more you challenge your muscles, the harder your lungs will have to work. And there’s your cardio workout for the day, done while you strength train. The more muscle mass you have, the better your metabolism becomes at burning fat. Working out at QuickHIT Fitness Labs will allow you to build and maintain muscle mass faster than you would working out at other gyms, which means you’re continually improving your fat burning ability. Building muscle mass makes it much simpler to maintain weight loss, as you are constantly improving your metabolic rate. If you lost weight and want to maintain that loss, high-intensity training is the way to go. Say goodbye to obsessing over getting in your daily workout just to maintain weight loss — with QuickHIT Fitness Labs high-intensity training, you’ll be able to maintain fat loss with just one workout a week. Many people struggle with flexibility, especially as they age. But improving your flexibility can make you more comfortable in everyday life as well as improve your fitness. And, with QuickHIT Fitness Labs, you’ll improve your flexibility while also building muscle. Our high-intensity training style moves your body through a full range of motion during each workout. In addition to making your muscles more flexible, it also impacts your ligaments and tendons, which improves balance and flexibility. This one may seem obvious for any strength training workout. But, lifting weights does not always result in more muscle tone. If you overdo your weight lifting workouts, you can actually hinder your ability to build muscle. Muscles grow in the days following a workout during your recovery, not during the workout itself, so taking some time to rest is essential. When you train at QuickHIT Fitness Labs, you work your muscles much harder than an average workout. This is a great thing, especially for older adults, since we lose muscle mass at a much faster rate as we age — muscle mass that is often replaced as fat. With high-intensity training, you will be able to build your muscle mass and maintain it, regardless of your age. If you want to improve your cardiovascular health, boost your metabolism, get flexible, and tone your muscles, give us a call at QuickHIT Fitness Labs.